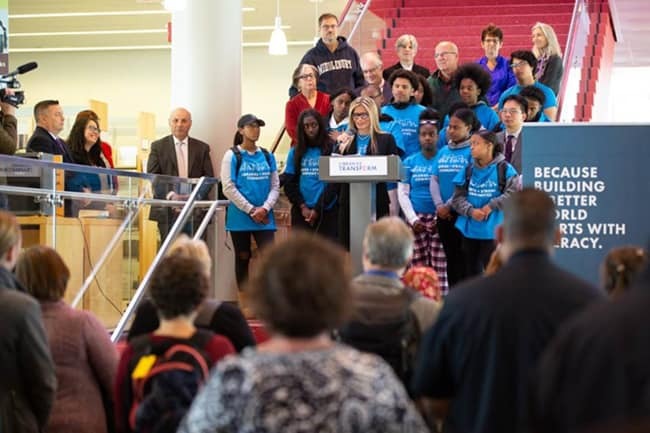 For the second stop of her Libraries = Strong Communities tour, American Library Association (ALA) President Loida Garcia-Febo traveled to Cambridge, Massachusetts, to tour academic, school, and public libraries. Her visit to Cambridge came on the heels of her October 10 speech to the European Parliament in Brussels, where she talked about her tour and explained how she intends to promote Libraries = Strong Communities as a global initiative. Garcia-Febo said one reason Cambridge was featured on her tour is the city’s commitment to providing everyone with equal access to information. She said Cambridge Public Library (CPL) has been especially vocal about providing assistance and resources to people who are under sanctuary city protection. 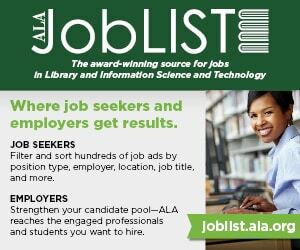 She highlighted the importance of academic libraries by surveying the libraries of Harvard University and the Massachusetts Institute of Technology (MIT) on October 17. She said Harvard and MIT embody her Libraries = Strong Communities initiative by giving public support to her efforts to promote diversity in the workforce, highlight wellness resources for librarians, engage in international professional exchanges and global collaboration, and advocate for libraries to provide services to everyone in the communities they serve. At Harvard, Garcia-Febo visited the Harry Elkins Widener Memorial Library and its newly renovated Godfrey Lowell Cabot Science Library and addressed Harvard staff members. 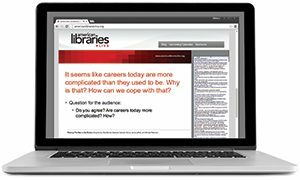 She told the group that now is the time to rethink and reimagine the relationship among libraries, librarians, and local and global organizations. “In this time of uncertainty, we need to roll up our sleeves again and renew our commitment to the communities that we serve,” she said. At MIT Garcia-Febo participated in a question-and-answer session that was livestreamed throughout campus. She learned about MIT’s Geographic Information Systems Lab and the library’s work with drones. She shared conversations about the importance of following societal and technological trends to inform library programs and services. On October 18, Garcia-Febo met with librarians at the Cambridge Rindge and Latin School, a high school located near CPL. There, Amy Short, assistant director of library media services at Cambridge Public Schools, shared information about the school and district, and librarian Emily Houston gave a tour of the library. Garcia-Febo also received information about the Massachusetts School Library Association’s position on the Special Commission on School Library Services, which are designed to strengthen school library services statewide and to address the many inequities discovered during a statewide study. Garcia-Febo said the school library was a model facility and a bastion of diversity, serving students from 30 different countries. Garcia-Febo spoke with Cambridge Public School students and their school librarians. Students from the Amigos School, a dual-language immersion program, talked with Garcia-Febo in Spanish, and students from Fletcher Maynard Academy shared their thoughts about the book Home of the Brave by Katherine Applegate, about a young immigrant from Sudan, and read essays and poems. Later, Garcia-Febo and the library’s youth services manager, Julie Roach, read Angela Dominguez’s How Do You Say? / ¿Cómo se dice? 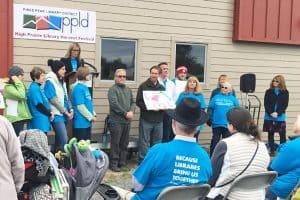 A rally was held later that day at CPL, featuring speeches by Garcia-Febo, CPL Director Maria McCauley, City Manager Louis DePasquale, and Mayor Marc McGovern. Garcia-Febo received citations from McGovern Massachusetts Governor Charlie Baker, and in her speech she urged the audience to support all types of libraries, including academic, public, and school libraries.